Lineup – Anouar Brahem: oud; Django Bates: piano; Dave Holland: bass; Jack DeJohnette: drums. Tunisian oud player and composer Anouar Brahem is a widely reputed artist who has recorded extensively on the ECM label. Indelible works such as Barzakh, The Astounding Eyes of Rita, and especially Thimar, a memorable trio session with British multi-reedist John Surman and American bassist Dave Holland, are among his most accomplished works. 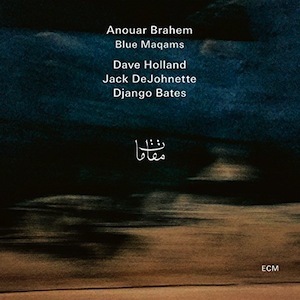 The top bass player mentioned above is part of the triumvirate that interact with Brahem in his latest outing Blue Maqams, a collection of mostly new compositions based on the Arabic modal music system that fits the unequal world chamber-jazz current he usually embraces. The other members are the British pianist Django Bates and the legendary American drummer Jack DeJohnette, who round out the real jazz rhythm section. “Opening Day” brings interesting ideas en-route, taking us instantaneously to torrid, distant places through the oud-bass singalong. Bates’ point of departure fully corroborates with Brahem’s melodic phrase. It all ends up in a three-side parallel melodic movement whose fluency is disrupted through a sensitive bass solo by Holland. The bassist’s amazing sound and virtuous sense of groove, always with DeJohnette’s sober-minded rhythmic measures alongside, constitutes the body of the songs. “Bom Dia Rio”, whose Portuguese title means ‘good morning river’, and “Persepolis’s Mirage” are typical cases of spectacular drifts delivered at unusual tempos. Masterfully layered, the former tune meditates through the oud sounds after jolting with a super 10/8 time signature. On the latter piece, marked by passages with 14 beats per measure, we can hear the exotic lute-like instrument, impeccably dominated by the bandleader, embracing deep-toned sounds while advancing in perfect consonance with the bass. There’s a soulful contemplation attached to “La Nuit”, where piano and oud embark on a candid one-to-one conversation, reflecting conjointly until the bass and the drums become involved. It feels like a tranquil prayer of gratitude. Denoting an inflation of the Western feel due to a delicate waltzing jazz approach, the title track changes radically when Brahem isolates himself, exploring his innermost musicality. After this retreat, the reappearance of the rhythm section sounds no less than magical. Regardless the title and the rhythmic touch, the piano-less “Bahia” doesn’t sound particularly Brazilian, rather exhibiting an occasionally hummed 2-minute solo introduction by Brahem, who first recorded this piece in 1994 with saxophonist Jan Garbarek for the latter's album Madar. Blue Maqams has no need to pound or poke, finding tranquility in the pragmatic acoustic formula and unblemished technique evinced by the quartet. In these disturbing times, nothing better than listening to music that is congenial, peaceful, and deeply felt. Anouar Brahem delivers all that and more.